I attended a workshop on fermentation of winter storage crops last weekend and I’m diving in with both feet. What a fantastic and simple way to preserve the root vegetables, cabbage and winter greens you might be tired of eating right about now. I’m already a convert to the health benefits of eating and drinking (Kombucha) fermented foods with all their healthy probiotics. I recommend reading about it more if you are new to the idea. 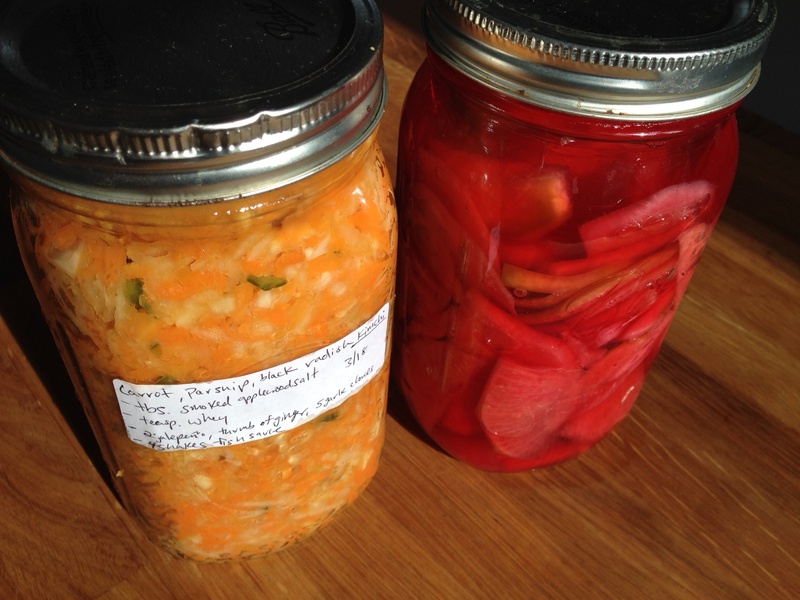 Kimchi is of course the most famous fermented vegetable condiment and you can also just be making these for the taste. I’ve got sliced water melon radish and carrot, parsnip, black radish “Kim Chi” going right now. -Sliced chucks of vegetables need to go in a brine, grated and finely shredded vegetables are massaged with sea salt and release their own juices to then make the liquid needed for fermentation. 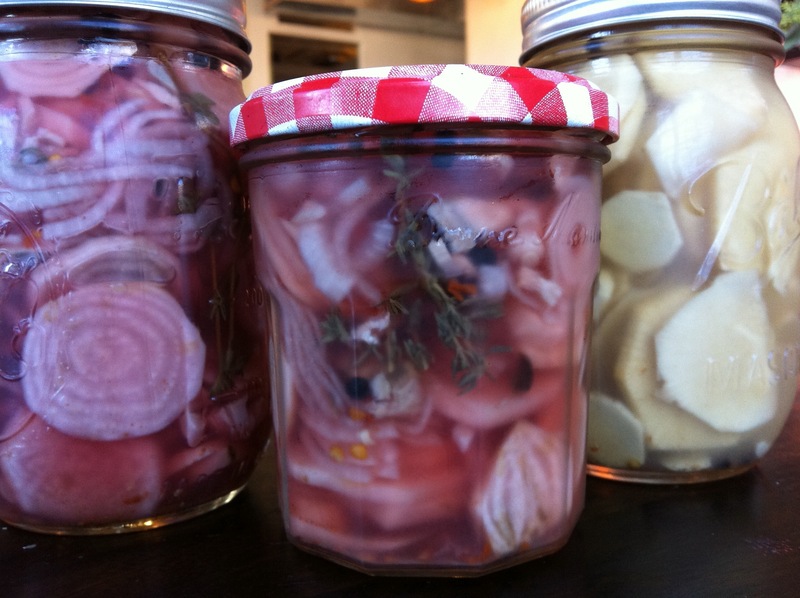 – Brine = 1 tablespoon of sea salt to quart of water and 1 tablespoon of yogurt whey. Plus anything you want to add for flavor. – IMPORTANT – Tap water used to make brine must be left out 24 hours so that the chlorine will off gas. Otherwise the chlorine will kill of the probiotics you wants to form. -The liquid whey from your organic plain yogurt helps as an additive when making a brine to get the healthy bacteria going. This is a somewhat low salt approach and even lower salt content can be used with the addition of a Tablespoon of the yogurt whey. -Yogurt whey also helps with high sugar content vegetables like beets and carrots, that can tend to go to fast into alcoholic fermentation. – Pack very tightly with fist into jar so that all air bubbles are pushed out – no oxygen is the key to growing the healthy bacteria only. Put the lid on jar somewhat loosely. Use a glass weight or a small glass jar to help keep vegetables pressed under the liquid, although not nessesary. I’ve just been checking my liquid level every couple of days. -Put away in a corner where it’s 60-70 degrees, on a tray to catch liquid that will bubble out. Most vegetables are done in 7-10 days . Taste daily to see if it’s “done” for your tastes. -Always make sure everything is submerged under liquid, mold will form on anything that is allowed to touch oxygen. That mold can just be scraped away and you can keep going. – A tip for keeping chunks of vegetables crisp in this process is adding a grape or oak leaf. For “Kim Chi” Style condiment I grated two pounds of mixed carrots parsnips and black radish, added 2 diced jalapenos, a big thumb of diced ginger, 5 cloves of garlic, 4 shakes of fish sauce and 1 healthy tablespoon of Applewood smoked sea salt. Massage the veg, minus the hot peppers until lots of liquid has releases, about 5 minutes. Add in the hot peppers and pack into your jar. 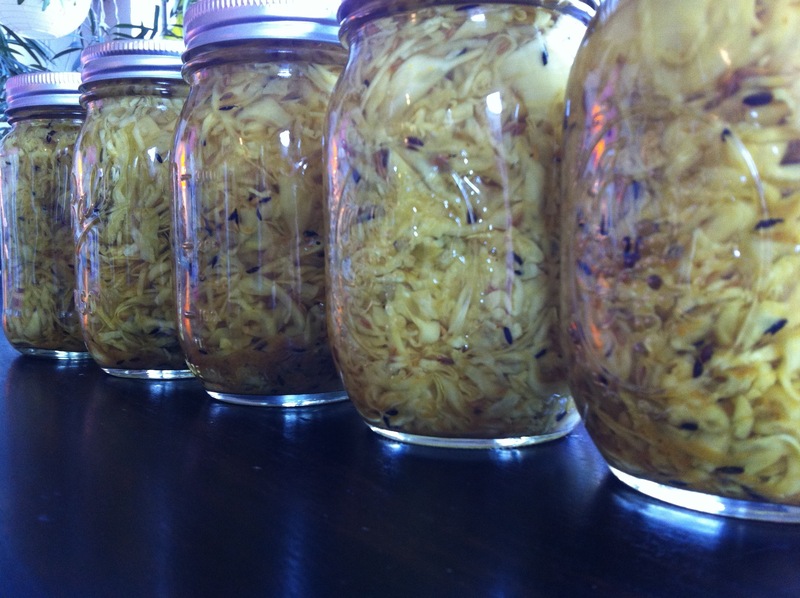 A clean jar is necessary but no stealization is needed as in canning. A great use for reusing jars. 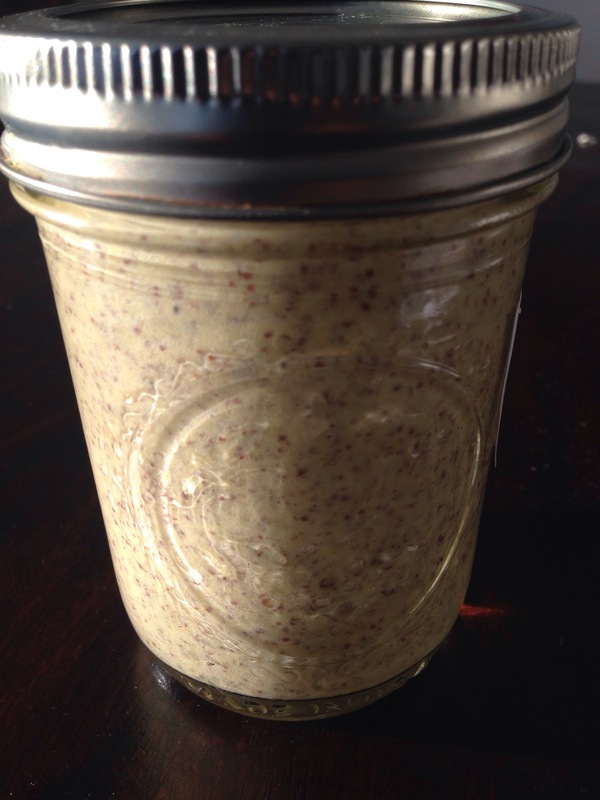 Now that I’ve made this whole grain champagne Dijon, I will be trying to make all different flavors. Not to mention that a $2.69 bag of mustard seeds makes about $50 bucks worth of gourmet mustard. I used just brown seeds and you can find them at Indian markets or finer grocery stores. I made a big batch so I could give some away too. You will need a large mouth glass jar and your stick blender. Put everything in your jar and let sit in a dark corner for 3 days. Then blend with your stick blender for about 7-10 minutes. You want the seeds to be just flecks and the mixture to emulsify. You’ll never buy mustard again. Keep refrigerated for months, but it will lose some of its punch over time so enjoy right away. 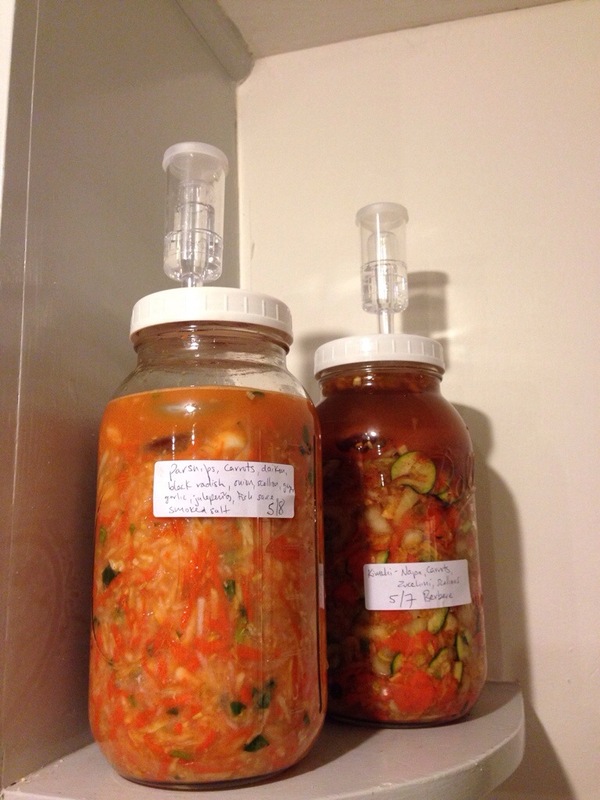 Somewhere on the continuum of sauerkraut, kim chi and pickles lies my Pickled Curry Cabbage. Made annually when my Enterprise Farm CSA provides more cabbage then I can handle fresh. It’s spicy and a little sweet and makes a great condiment for meat or really fun sandwiches. I use a mandolin to slice the cabbage super thin, but a big sharp knife works too. I’m assuming you all know the canning deal. 2 tablespoons pan-toasted whole cumin seed. About 3 tablespoon (to taste) Madras Curry Powder, which contains salt. Bring to a boil everything but cabbage to make a brine. Add cabbage and stir until cabbage wilts into brine. Fill your sterile jars and hot water process for 15 minutes. It only gets better with time. Try to wait at least two weeks. I’ve tried it as long as a year and it was excellent, but be very sure of your canning ability or store in the back of your frig. They were ready just in time to make an interesting relish tray for our Thanksgiving dinner. Election night 2012, I was so nervous I couldn’t sit still and chopping vegetables always relaxes me. In my vegetable drawer were some inglorious rutabaga and some candy stripped beets that weren’t getting any younger. I pulled out the mandolin, sliced up each and then contemplated them in their individual bowls. The rutabaga I decided needed to be adventurous so I sliced up some ginger and garlic and added it. The beets got garlic and some leftover fresh thyme, and everything packed into wide month jars. Then I set about to make my brine for both. My basic formula is half cider vinegar, half water. First briefly toast some whole coriander and pepper corns in your pot. Add about 2 cups vinegar and 2 cups water and about 1/4 cup salt and 1/4-1/2 cup sugar, and a bay leaf. This is for about 4, 16oz jars full. I then added some Ethiopian Berbere Spice blend for kick. Bring to gentle boil to dissolve sugar and salt. Pour into jars until vegetables are fully covered and then boil water process the sealed jars for 10 minutes. Pickles can be eaten in 2-3 weeks but do get better with some age. If you don’t want to bother with the water processing, just keep them in your frig. 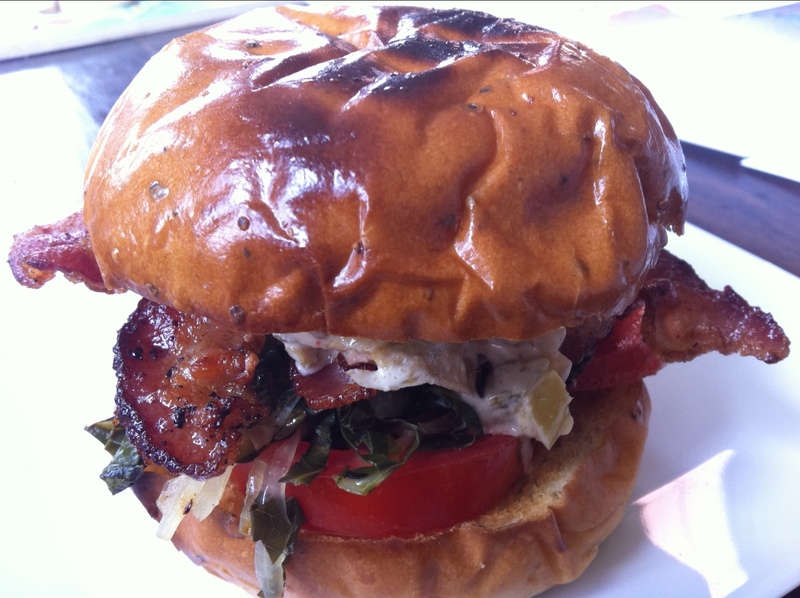 I try not to let my family eat cured or processed meats very often, the BLT is the exception. Here is one of many variations we enjoy. Toasted pepper brioche from Iggy’s Bread- Reduced Sodium Natural Bacon from Whole Foods- Julienne collards and onions, braised in seasoned rice wine vinegar- sliced tomatoes from the garden- My “secret sauce” = Grilled hot Hungarian and green bell peppers( peeled and diced), garlic powder , cumin, touch of Sriracha , mayo and some beef juice that got in with grilled peppers.